Hi there folks! Yesterday I tried something I’ve been meaning to do for ages, and that was to make burgers from absolute scratch. No pre-purchased mince, just animal parts and a grinder. The result? Amazing flavour, incredible consistency and most importantly, no wastage! This all started with lamb that I was prepping for the next day. Trim off all the fat you need to and take the trimmings – not the silver skin – and run it through a course grinder. You need a good piece of machinery to do this right. We use a sturdy Kitchen-aid more than anything. Set the fat aside in the fridge. Go and wash the grinder and parts thoroughly. Now get approximately 2.5 kg of beef chuck. The chuck is found above the brisket (pectoral muscle) of a cow. It’s the muscle cows use to throw things like basketballs and frisbees, not really but stranger things have happened. 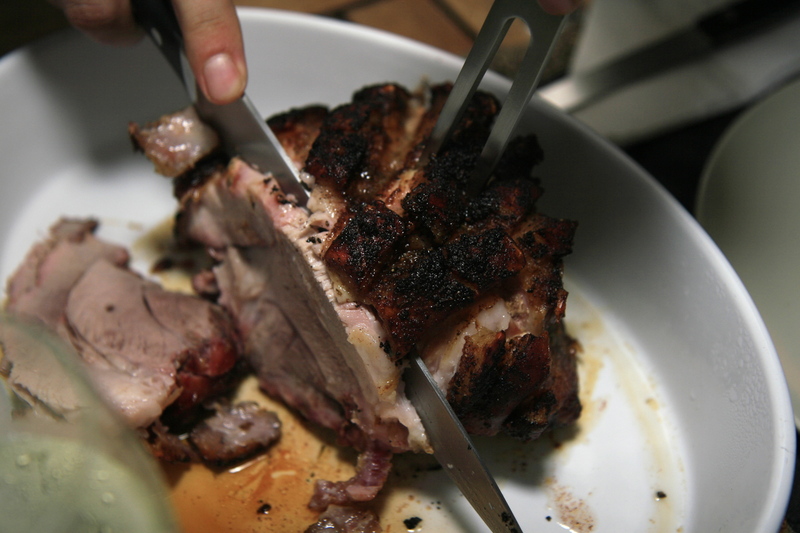 Trim off any silver skin and cube the chuck into pieces that are small enough to drop into your grinder feeder. Grind it up and get your lamb fat out of the fridge because now you combine. Chuck is very lean meat so you need some extra fat to give it a flavour boost and to help bind it and not make it rubbery. You want a rough ratio of 80:20 chuck to fat. You can use beef fat, suet, streaky bacon or as I did, lamb fat. Using a digital scale I took 500 g of beef and 100 g of lamb fat and combined the two in a metal bowl. Once combined I seasoned the mince with a hearty helping of Montreal steak seasoning and some kosher salt. Grab a handful and measure out about 150 g for each patty. Form your patties and place them on a baking sheet lined with non-stick baking paper. Repeat the process three times to yield 12 hearty-sized patties. Now put them all back into the fridge to help them firm up. At this point, go light your grill. 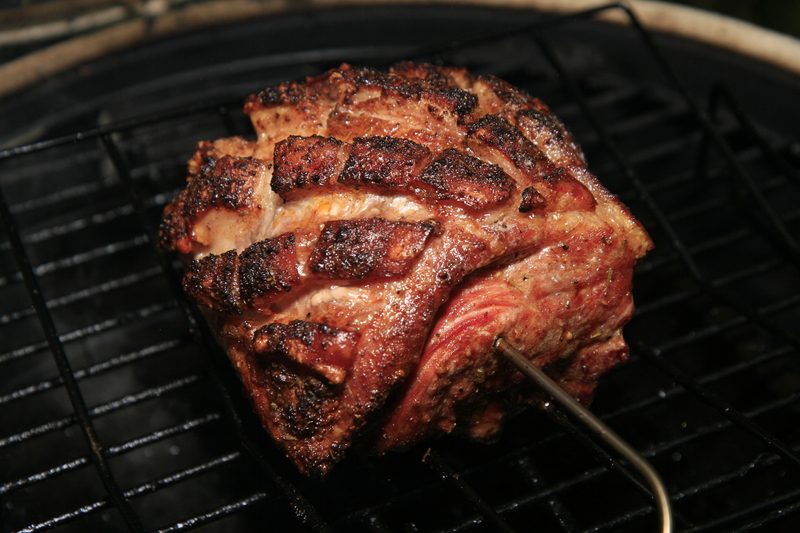 Set up your grill for about 450F – nice and hot. I used my trusty grill grates (a must have) to get a nice sear and the deep grooves allow for easy flipping. Put the burgers on and close the lid for 3 minutes then CAREFULLY open the lid allowing for a burp minimizing the chance of a massive fireball. Turn the burgers one quarter to left or right, this gets the nice diamond sear pattern. At five minutes flip the burgers and repeat the process. Make sure you’ve got an accurate instant read thermometer. You want to pull the burgers off at 155F. Just before you do that, add some shredded cheese and close the lid for about a minute. Remove the burgers and now place your buttered buns on for no more than 30 seconds. Stack on some veggies, mustard, ketchup, mayo or whatever else floats your boat. We served these up with sweet potato wedges and a nice bottle of red! Easy recipe and a great meal using a classic method. The lamb fat really provided a wonderful deep buttery flavour. If you want to wow your guests, this is surely the way to make cheeseburgers! Enjoy!